Hinkley, Calif., may soon become a ghost town as residents move away from contaminated water. 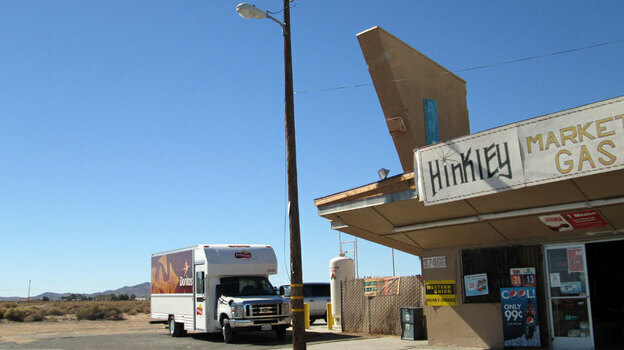 Hinkley, Calif., is the small town that battled toxic groundwater and inspired the 2000 film Erin Brockovich. Now residents say they are experiencing a sequel to their story. A few years ago, people started talking about the water again. Residents developed strange rashes and Pacific Gas & Electric Co. — blamed for the town’s groundwater pollution — was offering to buy homes again, this time in areas previously believed to be unaffected by the contamination. There were a lot of things Roberta Walker liked about the 6-acre piece of land she bought more than a decade ago. It had great views and plenty of space to ride her horses, and it was a good seven miles from the contaminated well water at her previous home. “We built a house and this is where we were and this is where we were going to stay,” she says. “There was no chromium here.” But now Walker says it’s time to leave. Julie Heggenberger, a 36-year-old mother of two, was just a teenager when PG&E agreed to pay $333 million to residents who claimed they had been made ill by toxic well water. For decades, workers at PG&E’s nearby compressor station dumped the chemical hexavalent chromium into waste ponds that seeped into the town’s groundwater. Heggenberger, who suffers from Crohn’s disease, says she never considered leaving before. She has deep family roots here. Pacific Gas & Electric acknowledges the toxic plume is larger than once thought, but disputes that it is actually growing. “The reason that it’s larger is because we are testing in areas that haven’t been previously tested,” says Jeff Smith, a spokesperson for PG&E. “A couple of options for local residents who live within a mile of the contaminated area from PG&E’s past actions here — what we offered was either a whole household water-treatment system or, for those that were interested, a property-purchase program,” he says. More than 200 property owners, over a quarter of the town, have elected to sell their homes to the utility. Along long stretches of asphalt, country mailboxes sprout like desert flowers amid scatterings of boarded-up houses. Theresa Schoffstall says her home just outside the boundary of the contaminated area does not qualify for the buyout, but her next-door neighbor’s home does. Schoffstall fears the home she and her husband built 12 years ago is now worthless, but most of all she worries about her children. The family has stopped drinking the water. “But I’m still cooking and we still shower and we have a swimming pool, and a lot of times people are telling you that’s harmless, but I don’t want 10 years from now, all of a sudden, [to hear,] ‘Remember we told you it was harmless? Now, no its not,’ ” she says. While the Schoffstall family struggles with the decision of whether to stay, 57-year-old Ray Pearce says his mind is made up. “I’m not moving. I like it here. If I didn’t like it here I wouldn’t live here. I’d be gone a long time ago,” he says. Pearce was born here, owns 20 acres and likes the quiet. He also likes his neighbors, but recently he’s been watching them go, one by one. Many of the families, some of whom have lived here for generations, are finally saying goodbye. They realize their town, a place where everyone knew and helped each other, is no longer. PG&E says the cleanup of Hinkley could take decades.